Project Alicia : more questions. Warning: This is a long one... intended only for scrapbookers and bloggers out there. This blog post is mostly for Amy, but also for all the others who have asked questions and those who haven't but are wondering. I do not profess to be any sort of expert. Infact, I thought everyone already knew what I know. The most recent question comes from Amy in Ohio. She writes, "I recently started my own blog about my family and two little ones (2 years and 6 months) and am looking for ways to "jazz it up." I really liked what you have done with your images (collages, adding fonts, etc.) and am assuming you did that using digital scrapbooking software. If you don't mind, would you share with me the name of the software you use? I'd love to give it a try!" I use Adobe Photoshop Elements. I'm a little embarrassed to admit it, but I still use the photoshop elements 2.0 most of the time. It only works through XP and when this computer kicks the bucket I'm in trouble. I also have photoshop elements 7.0, but am slowly trying to figure it out. It's a lot different than 2. They also have 8 available now. It's about $80 at Wal-Mart and has way more than you need to do cute things to your blog. No need to spend $800 on the photoshop suite unless you are planning to go into graphic design or something. The cute scrapbooking elements I add to my photos are an accumulation of freebies and online purchases I download. I used to get freebies from http://ikeagoddess.blogspot.com/. Unfortunately she stopped posting them about 5 weeks ago now. You can go to her blog and find her list of hundreds upon hundreds of scrapbooking sites she went to (that she had on her google reader). It's a little daunting, but you could go through the list and decide which ones you really like. Another great freebie site is http://digifree.craftcrave.com/. They have recently reformatted their blog so you have to click on the "digifree" tab at the top. They have updates every couple weeks. It's a really great variety. Another great site is http://digiscrapaddicts.com/. You have to log in and then they have freebies, tutorials, and more. http://www.taylormade-designs.net/ is good, offering great inspiration and tutorials. http://digitalscrapbooking101.ning.com/video offers amazing photoshop tutorials. You have to register. My favorite website that I purchase scrapbooking products from is http://www.designerdigitals.com/. They have 2 - $ .25 items on Sunday and Monday. They also have Thrifty Thursdays where over 250 items from various designers are 30% off for that day only. You can sign up and they send you an email reminder. They offer designs form Ali Edwards who is a favorite of mine. They also offer freebies, tutorials, and challenges. It's one to bookmark for sure. Two Peas in a Bucket is also a favorite. There are literally hundreds+ of blogs out there from very talented people. There are too many to name. You have to find what you really like. 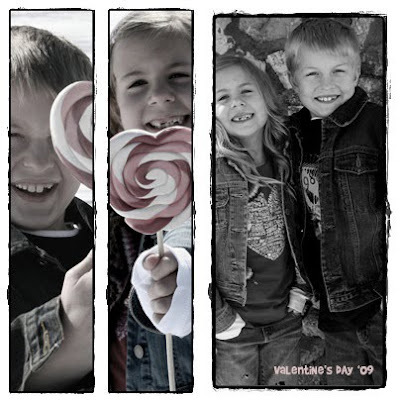 Once you have your photoshop elements and scrapbooking supplies you are ready to make cute headers and enhance your photos. Elements allows you to be able to open a blank page and add "layers". You can start with whatever size you like and then add photos, elements, borders, and more. It also has filters and special effects for your photos. It's fun to play around with, but I'm sure I haven't even scratched the surface of what it is capable of. When you want to make a collage you just open a page the size you want (file, new, then choose size and color), open the photos you will be using, and plug them in. There are many different ways to go about doing this. There are some templates out there that you can literally just plug them in. For some reason I like to have more control over my projects, so I don't normally opt for that route. I actually resize my photos and manually add them to my blank page. This way you are not limited by the number of photos or sizes of your photos. I love collages and have done too many to count, but here's a sampling of a few. This was a 12 x12 scrapbook page. It would also make a cute print to frame. Some of you may remember this one from my project 365 last year. It went into my album as the POTD in a 6x4 size. 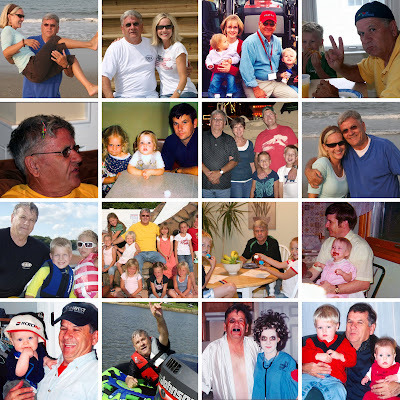 I made this 12x12 collage (pics thru the years) as a Father's Day gift for my Dad last year I actually enlarged another photo as well to a 12x12 size and put a cute quote on it. I framed both and they are hanging in his home. 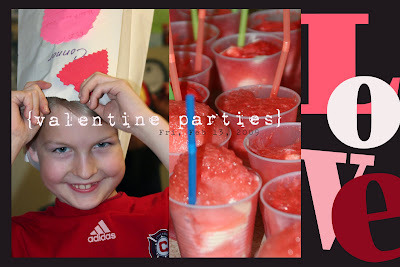 This is another POTD from my son's Valentine's party at his school last year; just to show you that collages can be done with any number of photos. This will be in my next post. 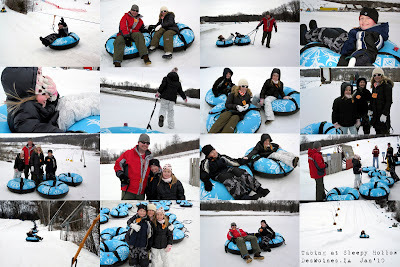 We went tubing this week and I had so many fun photos. I couldn't pick just one. I wanted to have them all in my album, so I opted for a collage. I did it in a 12x8 size, but will print it in a 6x4 for my album. That way I have the option to print it in the 12x8 size too. 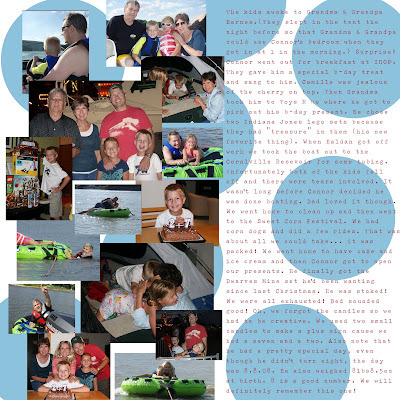 This was a 12x12 scrapbook page for my Little Man's b-day a couple years ago. 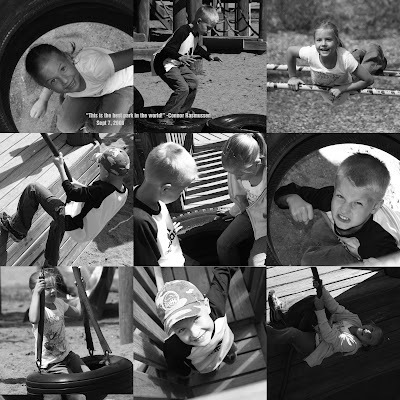 Sometimes it's fun to have a randomized collage. And another random one. 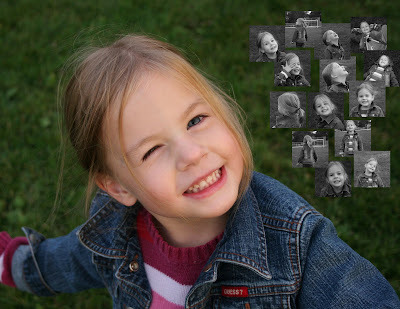 I miss those days when she would not only let me take lots of photos and didn't care, but she was so dang cute! Yet another 12x12 scrapbook page. What else do you do with all those photos of crazy critters? It is actually framed in a bubble frame in Little Man's room. 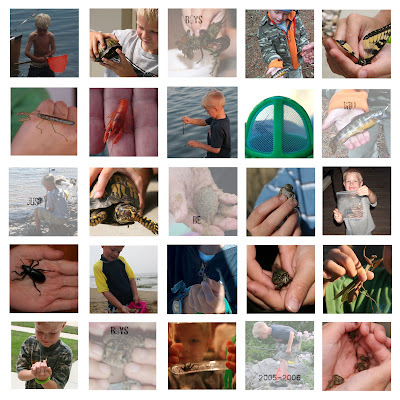 My sister in law also informed me recently that there are many collage makers available for download- for free! When I googled it I was shocked to find so many. That would be another route if you don't have the funds for the photoshop elements right now. Another idea that I've recommended to a few friends is photoscape. It is a program available for free download and although it doesn't offer nearly as much as photoshop, it's a great place to start. It was recommended to me by a friend a while back. I use it sometimes. These are some examples. Fonts work much the same way as the photos. They are just an additional layer you can add to your project. There are many cute quotes and phrases available for download. There is one site that specifically comes to mind, http://elegantwordart2.blogspot.com/. She does nothing but word art and they are all free downloads. You can add those to your work space in elements. I actually really like Ali Edward's handwriting, so I have bought some of her different themed text kits. I bought her days and months one, which has been very useful with my p365. They are available at http://www.designerdigitals.com/. Every now and again she offers something free from her blog, http://aliedwards.typepad.com/. It's a very inspirational blog to follow plus she always has giveaways. Not that I've ever won anything. I did a post last year when I was working on my daughter's scrapbook and shared some of my favorite fonts. 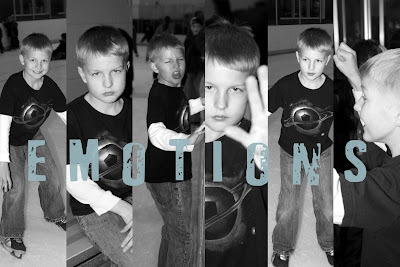 You can find the examples at http://weloveiowa.blogspot.com/2009/09/only-8-years-behind.html. It said, "FYI: "What fonts do you use?" is my most commonly asked question. My favorites are: CK Becky, CK Ali's Hand, 1942 report, 3 theHard way RMX, Depressionist Three. All are available for free download. You can get the CK Becky font here. (All of these scrapbook pages are with the CK Becky, as in Becky Higgins from Creating Keepsakes.) If you've never added fonts to your computer let me know and I can add a tutorial." Fonts really make a difference with a scrapbook page or picture. There are so many great ones out there. Some of my latest additions include: rusted plastic, sidewalk, and trashed- all very grungy-like. 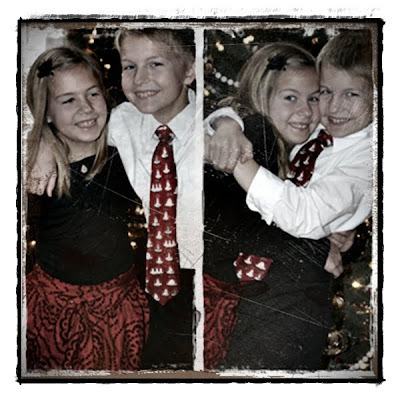 It is a very easy way to enhance photos. My current header was created in photoshop. I just made my background black and my text white. I saved it as a JPG and added it to my blog just as you would a photo. Very simple. You should google fonts and see what you can find. I'd love to know what your favorites are. I just had another question today. Sarah asks, "Wanted to ask you if you have printed up your blog? I want to do that but need a recommendation who to go through." Blog Printing, from QOOP, Inc., takes your blog from Movable Type, Wordpress, or Typepad and offers the options of black and white, or colour printing, in three different sizes. Printing from Blogger is unavailable at this time. Black and white books cost $7.50 for the first 28 pages, plus 4 cents per page for additional pages. Color books cost $12.00 for the first 28 pages, plus 30 cents per page for additional pages. If you set up an account to resell your blog, you can specify either a percentage or a flat royalty. Any royalties are added to the base cost of the book. Other options for blogger include Lulu.com, Print My Blog.com and Blurb. I actually started a blurb.com book, but have yet to complete it. (Getting close though.) I need to do the update and perhaps it will be a quicker process. Maybe it's just my computer though. The nice thing about blurb is you can literally download your blog. It does have to be tweaked and manipulated to work though. I have, however, done digital books the last couple years- a "year in review" type thing. There are all sorts of websites that offer this... snapfish, shutterfly, etc. Most photo developers offer this option as well now. I also print directly from my blog periodically as a type of journal and just keep it in a binder. I have kept a journal on the computer for at least the last decade or so, so blogging isn't much different. I actually own three different printers. Yes, three. It takes up a chunk in my office, but I can't part with any of them. I have 2 Epson photo printers. The smaller one allows me to print on my cds/dvds and the larger one prints up to 13 inches wide. I buy 13x19 paper and print most of my own 12x12 projects. My other printer is a very old HP, but still kickin'. It has a fax and scanner. I actually have a different HP scanner as well for photos, but am ready to upgrade. Don't tell my husband yet. I actually printed most of my P365 last year at Wal-Mart believe it or not. I was printing so many I decided it might be cost advantageous to take it elsewhere. Ink is pricey, especially Epson. I don't know if this has answered all of your questions, but I'm always willing to share the little I know. Feel free to email me at lish@mchsi.com. There are amazing tutorials out there, but I know it can all seem very overwhelming when you don't know where to start. I hope this has given you some direction. WOW! What a post. Thanks for sharing!! Just stumbled across your blog and in checking it out, found this post! Thank you SO much for all your info! Its fabulous!! I do traditional type scrapping and use Costco to print my pics because of the cost of ink. (I will reprint at home if I miscrop or something) Just thought I would share. thank you for ALLLLLLLL your info and AMAZING BLOG!